Need some shelter or a sun shade for an activity or while camping? Maybe you just want to build a den? Then why not borrow one of the District’s Parachutes? We have in our possession six ex-military Nylon PR7 Reserve parachute canopies (complete with lines attached). The lines are 5.5m in length and the parachutes themselves are 28ft in Diameter. 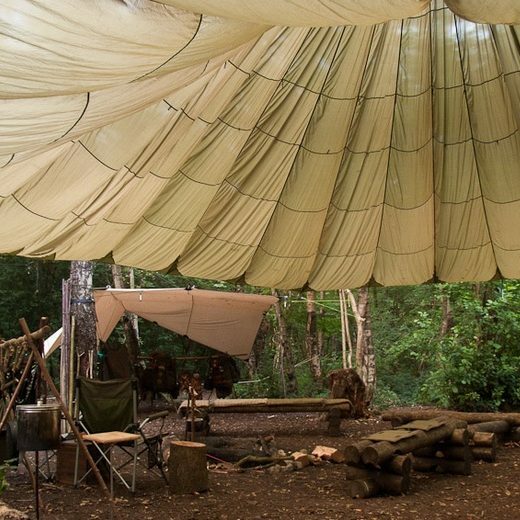 The parachutes are ideal for Bushcraft activities, building shelters, large communal areas during camps, technology projects, wide games or as sun shades. Under no circumstances must they be deployed as actual parachutes.